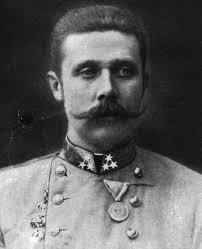 Franz Ferdinand (18 December 1863 – 28 June 1914) was an Archduke of Austria-Este, Austro-Hungarian and Royal Prince of Hungary and of Bohemia, and from 1896 until his death, heir presumptive to the Austro-Hungarian throne. His assassination in Sarajevo on the 28th of June 1914 precipitated Austria-Hungary's declaration of war against Serbia. This caused the Central Powers (including Germany and Austria-Hungary) and Serbia's allies to declare war on each other, starting World War I. Below is a timeline of events starting in July 1914. Events during 1915 and later are reduced to show mainly the ANZAC events and events affecting Australia and New Zealand directly and to a lesser extent, Great Britain. Click on the following links to navigate to your desired location. You can find a more detailed timeline at the History of the Great War website. The Australian Light Horse Assoc. The Kaiser receives at Potsdam special envoy from Austrian Emperor and promises "the full support of Germany" in the event of Austrian action against Serbia. He consults his military and naval advisers before leaving for a cruise in northern waters. Council of Austro-Hungarian Ministers finally determine on action against Serbia. Council of Austro-Hungarian Ministers approve of draft ultimatum to Serbia. Austro-Hungarian Government send ultimatum to Serbia (see 25th). German Government submit note to Entente Governments approving Austrian ultimatum to Serbia (see 23rd). Belgian Government declare that, in the event of war, Belgium will uphold her neutrality "whatever the consequences" (see 31st). Serbian Government order Mobilisation (see 23rd ). Austria-Hungary severs diplomatic relations with Serbia. Austro-Hungarian Minister leaves Belgrade. Austro-Hungarian Government order Partial Mobilisation as against Serbia (see 28th and 31st). Montenegrin Government order Mobilisation (see August 5th). British Admiralty countermand orders for dispersal of Fleets (see 28th). The Kaiser returns from the Baltic to Berlin (see 5th). German High Seas Fleet recalled from Norway to war bases. Austria-Hungary declares war on Serbia (see 25th and 26th). British Fleets ordered to war bases (see 26th). Russian Government order Partial Mobilisation as against Austria. (Evening) Russian Minister for War orders General Mobilisation without the knowledge of the Tsar (see 30th and 31st). Hostilities commence between Austria-Hungary and Serbia: Belgrade bombarded by Austrian artillery (see 25th, and December 2nd). German Government make proposals to secure British neutrality (see 30th). British Admiralty send "Warning Telegram" to the Fleets. British War Office send out telegrams ordering "Precautionary Period" (2:10pm). The Tsar signs order at 4pm for mobilisation of Russian army (see 29th and 31st). British Government reject German proposals for British neutrality (see 29th). Australian Government place Australian Navy at disposal of British Admiralty. Belgian Government order Mobilisation (see 24th). Russian Government order General Mobilisation (see 29th and 30th). Austro-Hungarian Government order General Mobilisation (see 26th and 28th). German Government send ultimatum to Russia (presented at midnight, 31st-1st) (see August 1st). State of "Kriegsgefahr" proclaimed in Germany - (see August 1st). Turkish Government order Mobilisation (to commence August 3rd). (see October 29th). British Government order Naval Mobilisation. German Government order General Mobilisation and declare war on Russia (see July 31st). Hostilities commence on Polish frontier. French Government order General Mobilisation. German Government send ultimatum to Belgium demanding passage through Belgian territory (see 3rd, and July 24th). German troops cross frontier of Luxembourg (see November 20th, 1918). Hostilities commence on French frontier. British Government guarantee naval protection of French coasts against German aggression way of the North Sea or English Channel. Moratorium proclaimed in Great Britain (see November 4). Belgian Government refuse German demands (see 2nd and 4th). British Government guarantee armed support to Belgium should Germany violate Belgian neutrality. British Government orders General Mobilisation. British Government issues Proclamation authorising requisition of shipping. British Government sends ultimatum to Germany. Great Britain declares war on Germany at 11 pm (midnight 4th-5th by Central European time). Belgium severs diplomatic relations with Germany (see 2nd and 3rd). Germany declares war on Belgium. German troops cross the Belgian frontier and attack Liège (see 3rd and 7th, and November 26th, 1918). Battle and Siege of Liège begins (see 16th). Two German airships pass over Brussels by night (first hostile act in the air). Secret Alliance between Germany and Turkey signed at Berlin. Montenegro declares war on Austria-Hungary (see July 26th). Austria-Hungary declares war on Russia. (Declaration presented at St. Petersburg). Serbia declares war on Germany (see July 28th). First units of British Expeditionary Force land in France (see 16th). Montenegro severs diplomatic relations with Germany. "State of War" commences between Montenegro and Germany (see 5th). British forces cross frontier of Togoland and occupy Lome (see 13th and 26th). British aerial cross-Channel patrol for the protection of transports instituted. France severs diplomatic relations with Austria-Hungary (see 12th). German warships "Goeben" and "Breslau" enter the Dardenelles (see 4th and 7th). Great Britain and France declare war on Austria-Hungary (see 10th). Austrian forces cross River Drina and begin first invasion of Serbia (see 25th). Proclamation issued by Russian Commander-in-Chief (The Grand Duke Nicholas) promising autonomy to Poland (see April 3rd, 1915). German troops cross frontier of British East Africa and occupy Taveta (see 8th. November 2nd, and March 10th, 1916). Junction of British and French squadrons effected at entrance to the Adriatic. Landing of original British Expeditionary Force (B.E.F.) [4 Divisions and 1 Cavalry Division] in France completed (announced August 18th) (see 7th). Battle of the Gette (18th/19th) in Battle for Antwerp. Belgian Army retreats from the Gette on Antwerp. Brussels occupied by German forces (see November 18th, 1918). German forces begin attack on Namur (see 25th). Battle of Charleroi begins (see 24th). British Government issue orders for the raising of the first New Army of six Divisions (see May 9th, 1915). Austria-Hungary declares war on Belgium (see 28th). Battle of the Ardennes begins (see 24th). Battle of Mons (see 24th). Germany severs diplomatic relations with Japan (see 15th). Japan declares war on Germany (see 15th). General von Hindenburg takes over command of German Eighth Army (see September 18th). British Army retreats from Mons (see 23rd, and September 5th). Battle of Charleroi ends (see 21st). Battle of the Ardennes ends (see 22nd). Austria-Hungary severs diplomatic relations with Japan (see 25th). Battle of the Meuse begins (see 28th). Battle of the Mortagne (Vosges) begins (see September 3rd). First use of aircraft for patrol purposes (over retreating British forces in France). Japan severs diplomatic relations with Austria-Hungary (see 24th). Japan declares "State of War" with Austria-Hungary. French Government issue new decree defining contraband (see 11th, and November 6th). Austro-Hungarian declaration of war received by Belgian Government (see 22nd). Naval action off Heligoland (German light cruisers "Köln", "Mainz", and "Ariadne" sunk by British squadron). Samoa occupied by New Zealand Expeditionary Force. Amiens entered by German forces (see September 13th). Lord Kitchener visits France to confer with the British Commander-in-Chief. French Government inform United States Government that they will observe "Declaration of London" subject to certain modifications. Battle of the Grand Couronné (Nancy) begins (see 12th). German Government agree to observe "Declaration of London" if other belligerents conform thereto, and issue their list of contraband. End of the Retreat from Mons (see August 24th, 1914, and November 11th, 1918). Battle of the Ourcq begins. German forces reach Claye, 10 miles from Paris (nearest point reached during the war). Reims taken by German forces (see 14th). British, French, and Russian Governments sign the "Pact of London." Decision not to make separate peace (see April 26th, October 19th, and November 30th, 1915). Battle of the Marne begins [French date] (see 9th and 10th). Naval operations off Duala (Cameroons) begin, in preparation for attack by Allied military forces (see 27th). German retreat from the Marne begins (see 6th). Battle of the Marne ends [British date] (see 6th). German light cruiser "Emden" makes her first capture in the Indian Ocean (Greek collier "Pontoporos") (see 22nd, and October 28th). German and Austrian representatives expelled from Egypt (see November 1st). British Government issue orders for the raising of the second New Army of six divisions (see August 21st and September 13th). Australian Expeditionary Force lands on the Bismarck Archipelago (German New Guinea). Battle of the Aisne 1914 begins (see 15th). Soissons (see 1st, and January 8th, 1915) and Amiens (see August 31st) reoccupied by French forces. British Government issue orders raising third New Army of six divisions (see 11th). Battle of the Aisne 1914 ends (see 12th). German New Guinea and surrounding Colonies capitulate to Australian Expeditionary Force (see 21st, and October 11th). General von Hindenburg appointed Commander-in-Chief of German Armies in Eastern Theatre (see August 23rd and November 27th). German armed forces in New Guinea surrender to the Australian Expeditionary Force (see 17th, and October 11th). British Proclamation issued adding to list of contraband (see August 4th and December 23rd). First Battle of Picardy begins (see 26th). First Battle of Albert begins (see 25th). German light cruiser "Emden" bombards Madras (see 10th, and October 28th). First British air raid on Germany (Düsseldorf and Cologne airship sheds attacked) (see October 8th). First use of wireless telegraphy from aeroplane to artillery (by British Royal Flying Corps). British force joins Japanese army before Tsingtau [Force landed September 22nd ; in action September 24th.] (see 2nd, and November 7th). First Battle of Albert ends (see 22nd). Actions on the Niemen begin (see 29th). Siege of Antwerp begins (see October 10th). First Battle of Artois begins (see October 12th). Duala (Cameroons) captured by Allied forces (26th/27th) (see 7th). Distinctive markings on German aircraft first reported (see November 12th). First Battle of Arras begins (see 4th). Ypres occupied by German cavalry (see 13th). British army begins to leave the Aisne and to move northwards (see 19th). First units of British Royal Naval Division (Marine Brigade) arrive at Antwerp (3rd/4th). First contingents of Canadian and Newfoundland Expeditionary Forces leave for England (see 15th). Minelaying in the open sea (between the Goodwins and Ostend) commenced by British (see August 5th). General Foch appointed to command Allied forces (less Belgians) defending the Flanders coast (see May 15th, 1917). Second British air raid on Germany (Düsseldorf and Cologne airship sheds attacked) (see September 22nd). Last forts of Antwerp taken by German forces (see 10th, and September 27th). First German offensive against Warsaw. Battles of Warsaw and Ivangorod begin (see 19th and 20th). Antwerp capitulates to German forces (see 9th, and September 27th, 1914, and November 19th, 1918). Protocol signed by United States of America and Panama as to use of Panama Canal by ships of belligerent Powers. Battle of Messines 1914 begins (see November 2nd). First Battle of Artois ends (see September 27th). Battle of Armentières begins (see November 2nd). Ypres reoccupied by Allied forces retreating from Ghent (see 3rd and 19th). First appearance of a German submarine on the Southampton-Havre troop-transport route reported. Belgian coast-line reached by German forces (see October 20th, 1918). First units of Canadian and Newfoundland Expeditionary Forces land in England (see 3rd, and February 9th, 1915). H.M.S. "Hawke" sunk by German submarine in North Sea. Battle of the Yser begins [Belgian date.] (see November 10th). New Zealand Expeditionary Force leaves New Zealand for France (see December 1st). Armentières recaptured by Allied forces (see 9th, and April 11th, 1918). First British submarines ("E.-1" and "E.-9") enter the Baltic. German submarines attempt raid on Scapa Flow (see 18th). First units of Australian Imperial Force embark for France (see December 1st). Grand Fleet withdraws from Scapa Flow to West of Scotland (see 17th, and November 3rd). Battles of Ypres 1914 begin (see 31st, and November 22nd). Transfer of British army from the Aisne to Flanders completed (see 3rd). Battle of Warsaw ends (see 9th). First merchant vessel sunk by German submarine (British S.S. "Glitra") (see. February 19th and March 13th and 28th, 1915). Battle of Langemarck 1914 (Ypres) begins (see 24th). United States Government issue Circular Note to belligerent Governments stating that they will insist on existing rules of International Law (see July 28th, 1916). Battle of Langemarck 1914 (Ypres), ends (see 21st). German cruiser "Emden" raids Penang Roads and sinks Russian cruiser "Zhemchug" (see September 10th and November 9th). Battle of Gheluvelt (Ypres) begins (see 31st). Turkey commences hostilities against Russia (see July 31st. and November 2nd and 5th). Turkish warships bombard Odessa, Sevastopol, and Theodosia. New British Order in Council revises list of contraband and modifies "Declaration of London" of 1909 (see August 20th, 1914, and July 7th, 1916). Allied Governments present ultimatum to Turkey (see 29th). Great Britain and France sever diplomatic relations with Turkey. British and French Ambassadors demand passports (see 31st, and November 5th). British hospital ship "Rohilla" wrecked off Whitby. Lord Fisher appointed First Sea Lord, Great Britain (see 29th, and May 15th, 1915). Critical day of Battles of Ypres, 1914: British line broken and restored (see 19th, and November 11th). Battle of Gheluvelt ends (see 29th). British Government issue orders for hostilities to commence against Turkey (see 30th, and November 1st and 5th). Lord Kitchener sends to Sherif of Mecca conditional guarantee of Arabian independence (see July 14th, 1915). Great Britain and Turkey commence hostilities (see 5th, and October 30th and 31st). Martial law proclaimed in Egypt (see September 10th and December 18th). Battles of Messines and Armentières end (see October 12th and 13th). Russia declares war on Turkey (see October 29th). "State of War" commences between Serbia and Turkey. British Admiralty declare the North Sea a military zone. First German naval raid on British coast near Gorleston and Yarmouth. Allied squadrons bombard forts at entrance of the Dardanelles (see December 13th). German cruiser "Karlsruhe" sunk in the Atlantic by internal explosion (see August 6th). German cruiser "Yorck" sunk by mine off the German coast. Russian forces cross frontier of Turkey-in-Asia and seize Azap. Moratorium in Great Britain ends (see August 2nd). Great Britain and France formally declare war on Turkey (see 1st and 11th, and October 31st). Turkey severs diplomatic relations with Belgium. British submarine "B.-11" proceeds two miles up the Dardanelles. (First warship to enter Straits.) (See December 13th). German cruiser "Emden" destroyed by H.M.A.S. "Sydney" at the Cocos Islands (see October 28th). Battle of the Yser ends [French date.] (see October 16th). British force storms Sheikh Saïd (Southern Arabia) and destroys the defences (10th/11th). Battle of Nonneboschen (Ypres). Attack by German Guard repulsed (see 22nd, and October 19th and 31st). The Sheikh ul Islam issues Fatwa declaring Jehad (Holy War) against all the Allies (see 2nd, 5th, and 14th). Orders issued for all British aeroplanes on Western front to bear distinguishing marks (see September 28th). Sultan of Turkey as Khalif proclaims Jehad against those making war on Turkey or her allies (see 11th). Japanese Cabinet decide against despatch of troops or warships to Europe (see February 8th, 1916, and April 17th, 1917). British, Belgian, and French Governments withdraw proposal for neutralisation of African free trade zone in view of altered situation (see August 22nd). Battles of Ypres, 1914, end (see October 19th, 31st, and November 11th, 1914, and April 22nd, 1915). War Office assume control of the British operations in East Africa. General von Hindenburg promoted Field-Marshal (see September 18th, 1914, and August 29th, 1916). First units of Australian and New Zealand Expeditionary Forces arrive at Suez (see October 16th and 17th, 1914, and February 20th and April 25th, 1915). British Government agree to Japanese request that Australia should not occupy German islands north of the Equator (see 16th). Battle of the Falklands. Admiral von Spee's squadron destroyed. "Scharnhorst", "Gneisenau", "Leipzig" and "Nürnberg" sunk. Admiral von Spee killed (see November 1st). "Dresden" escapes (see March 14th, 1915). German airship sighted off East Coast of England (first appearance of hostile aircraft in vicinity of British Isles (see 21st). Scarborough and Hartlepool (East coast of England) bombarded by German battle cruiser squadron. Japanese Foreign Minister declares Japan will not give up German islands occupied north of the Equator (see 3rd, and February 14th, 1917). British Government declare Khedive Abbas Hilmi deposed, and proclaim Prince Hussein Kamel Pasha as Sultan of Egypt (see October 9th, 1917). Great Britain declares adherence to Franco-Moorish Treaty of 1912. First Battle of Champagne begins (see March 17th, 1915). British defence of Givenchy 1914 (20th/21st). First German air raid on England. Aeroplane drops bombs in sea near Dover (see 24th, January 19th, 1915, and July 20th and August 5th, 1918). Jasin (East Africa) occupied by British forces (see January 18th and 19th, 1915). Second air raid on England (see 21st). First bomb dropped on English soil (near Dover). Russian Commander-in-Chief (Grand Duke Nicholas) suggests a British expedition against the Turks to ease Russian situation in the Caucasus (see January 13th, 1915).